Brendan Kiely figured the assembly was probably 60 percent black, 40 percent white. Jason Reynolds thought otherwise: to him, it looked more like 40 percent black, 60 percent white. For the two young-adult authors, who had been invited to speak to students at a school near Ferguson, Mo., it was not a surprising disparity. Kiely, who grew up in Melrose, is white. Reynolds, who was raised outside Washington, D.C., is black. They know they can walk into the same room and see two different realities. That was precisely why they decided to write a book together. 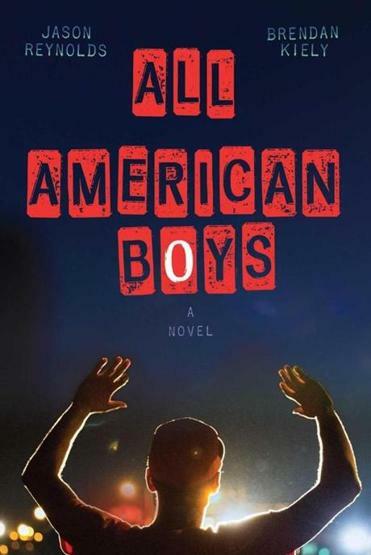 The new book they’ve coauthored, “All American Boys,” tells the story of a black boy in high school who gets roughed up by a police officer after a misunderstanding, and a white classmate who happens to witness the beating. Reynolds wrote the chapters from the perspective of Rashad, the boy who finds himself in trouble with the law; Kiely wrote the ones in the voice of Quinn, the witness. The book, published in September, has drawn considerable attention. Publishing journals have given it starred reviews, calling it “timely and powerful” and “a deeply moving experience.” The authors set out on a book tour to schools, bookstores, and other venues, including a stop in October at the Boston Book Festival. Their goal has been to get young readers thinking about the recent spate of real-life, racially charged policing incidents, and how to process their emotions about it. So the authors spoke about the importance of youth literacy. Then they opened the floor to questions. In the book, Rashad is a ROTC student accused of trying to steal a bag of potato chips. Quinn, the boy who sees Rashad’s detainment, is close friends with the younger brother of the aggressive officer. Meanwhile, Rashad’s father, a former officer, reveals that he was once accused of excessive force himself. Policing is hard work, the authors make clear. Reynolds, speaking on the phone from his home in Brooklyn, N.Y., recalls that his first encounter with Kiely was on a joint book tour two years ago. The trip occurred on the heels of George Zimmerman’s acquittal in the shooting death of Trayvon Martin. After a few days, Reynolds and Kiely broke the ice, and they found they were in agreement that justice had not been served in the Zimmerman case. “Once we started talking about it, we really started talking about it,” Reynolds said. The more similar incidents became national news, “the further we went down the rabbit hole,” he said. In the wake of the shooting death in Ferguson of Michael Brown, Kiely suggested the two authors address the issue of racial profiling head-on — by writing a novel about it together. 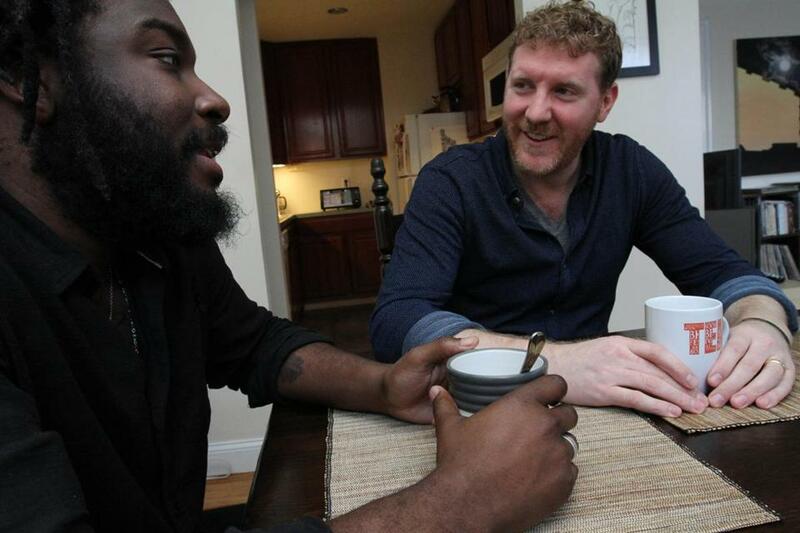 “Our goal was for the book to be a safe space for a conversation about implicit bias,” said Kiely, 38, who lives with his wife in New York. He was home in Massachusetts visiting his parents for Thanksgiving. “Boston is pretty infamous for race relations,” Reynolds said. “We had to talk about it. There were black boys and girls attending the school during his time there, bused from Dorchester and Jamaica Plain through the METCO program. But he didn’t know them well. “Everything was about rolling with my neighborhood friends,” said Kiely, who is 38. After he started attending St. John’s Prep in Danvers (“In four years, I remember one black kid there”), Kiely became drawn toward activism. With friends, he formed a group called the Association for Social Consciousness, and they tried to start a scholarship fund for underprivileged students. Kiely’s first book for young readers, “The Gospel of Winter,” addresses the clergy sexual abuse scandal in the Roman Catholic Church. Neither man originally planned to become a young-adult author. In college, Reynolds was a performance poet. “I wanted to be Langston Hughes,” he said. But now that he is writing for young readers — “All American Boys” is his fourth title — he’s thrilled. “I can’t figure out who else is more worth writing for,” he said. Initially, the two writers didn’t tell their mutual publisher or their agents about “All American Boys.” They were aware of a commonly held notion that authors working together can be “career suicide.” After collaborating on the opening chapter to set the stage, they wrote the rest of the chapters individually. For both authors, the book is a continuation of their efforts to raise questions about social issues among young readers. While promoting “The Gospel of Winter,” Kiely was confronted by a young woman who asked why his female characters weren’t as well developed as the males. “To me, one of my female characters was the real hero of the story,” he said. It hadn’t occurred to him that he could have written her better. Two months after its publication, “All American Boys” has sold better than any of either writer’s previous books. What was more important to the authors, however, was to make their own budding friendship work. If the book got published but the friendship didn’t survive, “then the whole project would be a failure,” said Kiely. Now they’re planning a double-date trip to Miami to celebrate Reynolds’s birthday. ”People sort of assume this was my idea by default, but it was his. 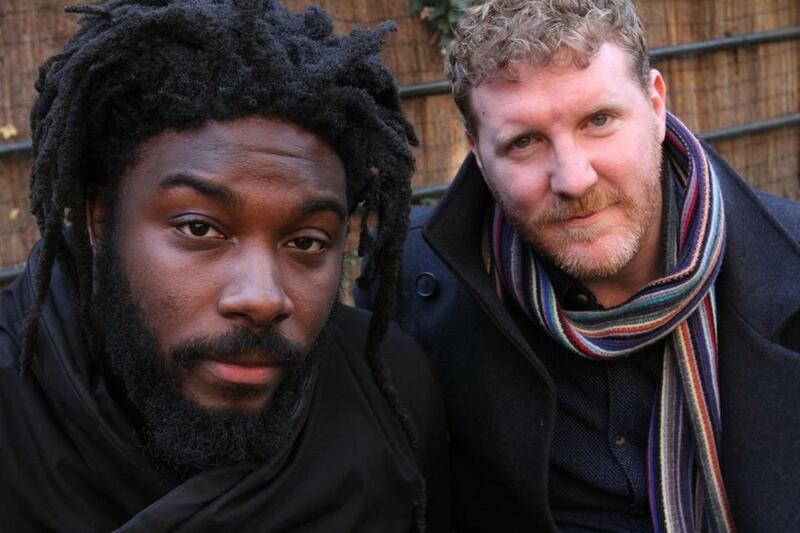 I said, “You know what, I trust you.” And we got at it,” said Jason Reynolds (left), on deciding to coauthor “All American Boys” with Brendan Kiely.